This is a brief introductory review of the app Proteus. I have tried to be honest with the review as I always do. Hope this review will give a good insight into using the app easily. The special features of the app and the Pros and Cons have been listed below. Hope this article is useful. Want to test your circuit diagram? Breadboarding it can be a good option, but it is easy to get confused if your circuit is big. You can try creating a PCB and testing on it, but is a very time-consuming task and even takes a lot of effort. Simulating it is the best idea. You can use Proteus 8 Professional. 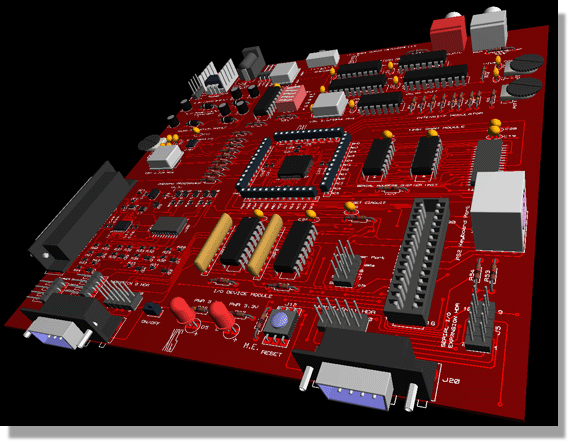 Proteus 8 Professional is a software which can be used to draw schematics, PCB layout, code and even simulate the schematic. It is developed by Labcenter Electronic Ltd. 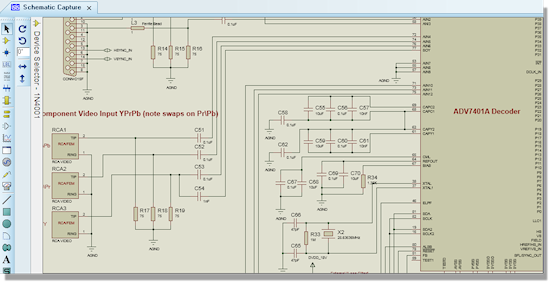 Drawing the schematic is very easy using Proteus. You can click the "Pick devices" button and select the desired component. You can draw wires by clicking on the terminal of the component or Vcc, Ground, etc. Circuit ready for testing? You can test it using Proteus's simulation feature. Many of the components in Proteus can be simulated. There are two options for simulating: Run simulator and advance frame by frame. The "Run simulator" option simulates the circuit in a normal speed (If the circuit is not heavy). "Advance frame by frame" option advances to next frame and waits till you click this button for the next time. This can be useful for debugging digital circuits. You can also simulate microcontrollers. The microcontrollers which can be simulated include PIC24, dsPIC33, 8051, Arduino, ARM7 based microcontrollers. You can download the compilers for Proteus or use different compiler and dump the hex files in the microcontroller in Proteus. You can even interact in real-time with the simulation using switches, resistors, LDRs, etc. There are even virtual voltmeter, ammeter, oscilloscope, logic analyzer,etc. 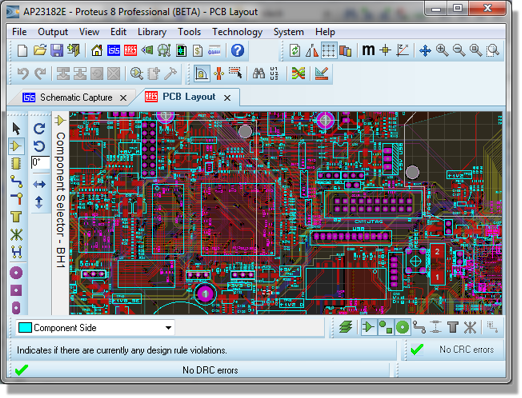 Designing PCBs are easy using Proteus. You can make your own design or let Proteus do that for you. Making your own design is simple, you just have to place the components used in the schematic and draw traces over them. Don't worry about violating any design rules because it automatically detects design rule (DRC) errors. You can also let Proteus do the work for you. You can place the components on their respective places and select the "auto route" option. This will automatically draw multiple variations of traces and selects the best one. There is also an "Auto placer" option present; this option needs you to specify the board dimensions by drawing the shape and size of the board so that, it can place the components within the board boundaries. So, all you have to do is to make the schematic. You can now look at your finished PCB design without actually making one. The 3D visualization feature virtually creates a 3D model of the PCB. You can use this to verify whether it will look like you imagined. Tired of keeping track of the budget? 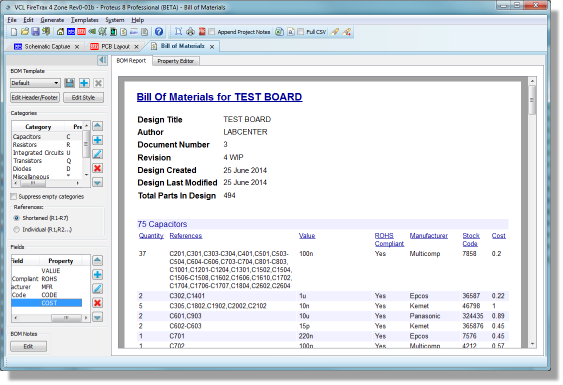 Now you can use Proteus 8 professional's "Bill of materials" feature. You just have to specify the cost of each of components. After specifying the cost for all items, Proteus automatically makes a list of all components used with their individual price and total price. You can interact with the running simulation, using switches, etc. Virtual electronic measurement instruments are available. User interface could have been made better. Proteus 8 Professional is software which can be used to draw schematics, PCB layout, code and even simulate the schematic. You can simulate your work and be more efficient in completing the task at hand. Hope this articles about Proteus 8 Professional is useful. Thank you for reading.